Authorities had no leads about who she was, nor how she died because there was no obvious signs of trauma. 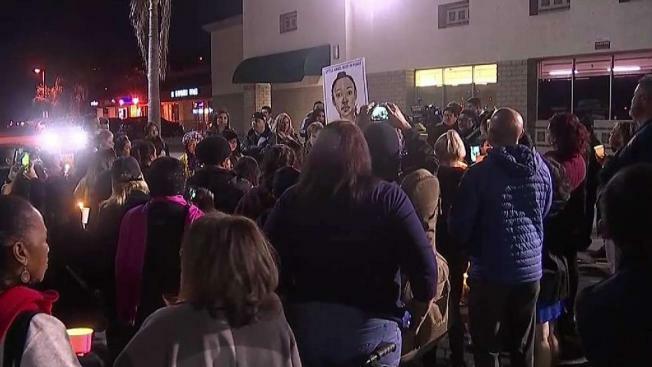 A vigil was held Thursday night for a girl whose body was found stuffed in a duffel bag off an equestrian trail in Hacienda Heights, California. Singing "He's got the whole world in his hands," about 70 people gathered near where the girl, believed to be between ages 8 and 13, was found near a Buddhist Temple. "This little girl is now part of this community," said Marlene Contreras, the vigil organizer. Joseph Contreras, 11, was out Thursday night paying his respects to the unidentified girl. "I feel lots of sadness about her," he said. Detectives revealed few leads. They didn't know who she was and said there were no obvious signs of trauma. They reached out to the local school district but it didn't appear that she went to school there. But people showed up to mourn the girl, regardless. "In a county of 10 million people, her life did matter," said Los Angeles County Supervisor Janice Hahn, who was at the vigil. A sketch depicting the girl — described as African American, 4 foot 5 inches tall and 55 pounds — was released during a news conference Wednesday. The sketch shows her wearing a pink long-sleeved shirt that read, "Future Princess Hero," and panda patterned pants. County workers clearing brush and doing maintenance on a trail discovered the body Tuesday about 10 a.m., said Los Angeles County Sheriff's Lt. Scott Hoglund. Investigators believe the body was dumped down an embankment south of Colima Road sometime between Sunday night and the morning the body was found. The body was found partially stuffed inside a black rollaway-type duffel bag, the upper portion of the body protruding from the bag, officials said. Detectives don't know if the girl was dead or alive when she was put in the bag. Patrick Healy contributed to this report.